Our Infrared asphalt heater is the cutting edge of infrared technology and easily sets us apart from the rest of the competition. Infrared is ideally suited for asphalt repairs around manholes, catch basins transition areas, reworking rough pavement areas, alligator cracked areas, and paver seaming applications. 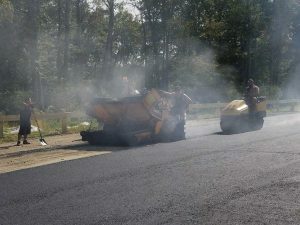 It uses heat to soften asphalt pavement without burning off integral tar oils (which provide asphalt its flexibility). After a few minutes of heating the asphalt, it can then be raked and rolled back into place while adding hot mix when necessary. The result is a seamless repair that is sure to meet the customer’s satisfaction. Contact George Hartshorn Paving for an idea of whether or not this is a good idea for your driveway or parking lot repair needs!